When training a Labrador, or any breed of dog for that matter, rewarding good behaviour and positive reinforcement of commands makes the task a whole lot easier. Positive reinforcement simply means encouraging your Lab by reward; not using punishment or force which, sadly, some trainers still think is the best way to train an animal. Positive reinforcement can be done in several different ways; by rewarding behaviour with a treat or nibble, by vocal and visual expression (in other words going as loopy as a Labrador and pulling his ears and ruffling his head) or by training devices such as clickers. Dog training should begin as soon as the puppy is brought home. As shocking as it may seem an awful lot of people get rid of young Labradors because they can be exuberant and a constant ball of uncontrollable energy. Needless to say; if a puppy behaves like this than it is the owner and not the dog who is to blame. To avoid this state of affairs puppies need to be made aware of their boundaries and how you expect him to behave. You can make your Lab learn these values quite easily. When training a Labrador it is important to remember that Lab puppies have the attention span of a geriatric goldfish. Training sessions need to be short, sharp and fun preferably focussing on just one behaviour such as ‘sit’, ‘come’ etc. Don’t push the puppy too hard. As he gets older the training sessions can be extended, in fact your Lab will probably insist on the sessions being extended. By the way. If you are a parent and first time Lab owner can I say that bringing up a child is, well child’s play, compared to raising a Lab puppy. If you thought a child can be demanding wait until your Labrador gets going. You won’t know what’s hit you. In a pleasant, playful way of course! Labradors have a wonderful gift of selective hearing or being able to turn a deaf ear when they want to. Despite this do not repeat your commands time after time. Saying the command more than once will make the Lab think he can safely ignore commands. 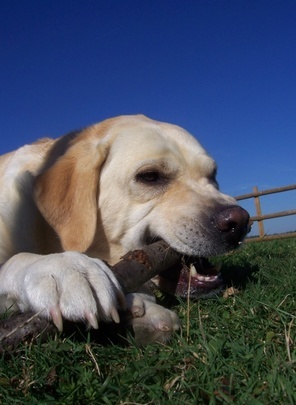 The most important thing to remember when training a Labrador is to reward good behaviour. When he’s done something right let him know it my making a big fuss of him and perhaps also giving him a small treat. Finally, don’t be afraid to keep your Lab on his lead when training. By having him on a lead it is much easier for the owner to manage the dog, especially at the start of a training regime. The lead can be dispensed with later when you are confident your Lab is responding smartly to your commands. In dog training a little owner education goes a long way. If you don't want to bother or can't attend a local class with with a trainer, the next best thing is a little education. The best courses follow a proven sequence for stepping you and your dog through a series of learning exercises. Better yet, the first lesson is free so you have nothing to lose by giving it a try. You can access this free dog training lesson here.